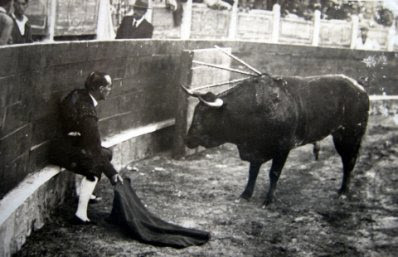 The poem we'll be reading (or skimming, or skipping, or whichever gives you the most pleasure) was written to commemorate his friend Ignacio Sanchez Mejias (1891 - 1934), a poet, actor, and bullfighter who sustained a fatal goring by a bull named Granadino. It's a long one, but it's rather lovely -- and like yesterday, we see a lyrical refrain being put to good use. I will not see it!! What is they saying? A stenching silence settles down. and we see it being filled with depthless holes. without hearing the double panting of the bulls. Go, Ignacio, feel not the hot bellowing. because you have died for ever. nor the black satin in which you crumble. Well it looks like NPM is over. I certainly am appreciative that you took the time to post all of this, and despite the lack of comments, I'm sure many others are too. Can't wait till next year!